From left to right: Jim Creel, Taco John’s CEO; Marian Orr, Mayor of Cheyenne; Diana Tafoya, Taco John’s General Manager; Rhianna Brand, Grace For 2 Brothers Operations Director; Gregg Jones, Jonah Bank Executive Vice President. 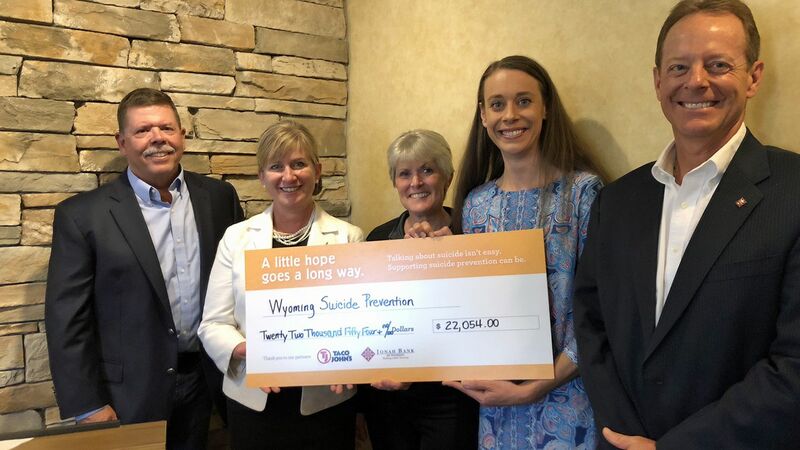 Two local businesses – Taco John’s and Jonah Bank of Wyoming – recently joined forces for a month-long campaign to fight the rising incidence of suicides across Wyoming. Throughout May, participating Taco John’s and Jonah Bank locations collected donations to support statewide suicide prevention programs. 100% of the proceeds from the fundraising efforts are included in the donation. What: Campaign donation and check presentation to suicide prevention organizations statewide. When: Wednesday, June 13, beginning at 1:15 p.m.
Why: Help spread awareness. Wyoming has one of the highest suicide rates in the nation. It’s important to get as many people involved as possible to show those in need that they have people who care about them and that they can to reach out to. Founded in 2006, Jonah Bank of Wyoming has been steadily growing in the Casper and Cheyenne, Wyoming, communities. Our mission is simple: We shall work to “Build a Better Wyoming” and we will treat our Employees, Customers and Communities as we would wish to be treated.